Hélène Darroze is one of the leading female chefs in the world. Her restaurant in Paris, Restaurant Hélène Darroze, holds two Michelin stars, and she gained a further star for her restaurant at The Connaught in 2009. This 41 year old single mum’s career as a chef started later than that of many other chefs as Darroze never aspired to be a chef until her mid-twenties. Initially deciding to follow in her father’s footsteps, she trained to become the general manager of their family-owned Relais & Château hotel and restaurant in Villeneuve-de-Marsan in Southwest France. It wasn’t until 1990, when Darroze began working for Alain Ducasse at his three Michelin starred Le Louis XV in Monaco, that her path took a turn. Ducasse convinced her that her destiny was as a chef, and thereafter took her under his wing. Initially, her training with him encompassed little more than to clean lettuce and to turn butter in a pan. With her BA in Business, Darroze was eventually assigned to the role of Administrative Manager of Ducasse’s Bureau where she managed personnel, public relations and his professional travels. She also assisted in the writing of Ducasse’s book ‘Riveira’ and his documentary ‘A week in the Kitchen’. Darroze returned to her family’s hotel in 1993. Because of their conflicting culinary approaches, her father decided to voluntarily resign, and Darroze took over as the head chef. In 1995, the hotel was renamed after her, and she successfully retained its solitary Michelin star. It was at this time that she garnered various awards, including ‘Young Chef of the Year’, ‘Chef of the Year for the Southwest Region’ and ‘Tomorrow’s Great Chef’, the latter granted by Gault Millau. Due to financial problems, she had to close the hotel in 1999, although she quickly went on to open her current restaurant in Paris. Michelin awarded it with a star in 2001, and a second star two years later. When she was approached to take over as executive chef at The Connaught Hotel to replace the outgoing Angela Hartnett, Darroze was reluctant to commit. Nevertheless, after visiting the hotel, she was convinced it was the right move and she signed on to oversee both its formal dining room as well as its more casual cafe (Espelette). For this purpose, she transported her team from Paris, including her head chef, Raphael François, to create a 21 person strong team in the kitchen. Darroze herself cooks in London every other week. So against such an auspicious backdrop, we began our lunchtime adventure in the grande dame of a dining room that is Hélène Darroze at The Connaught. For the purpose of this review, we decided to sample from both the `a la carte and the business lunch menus so that we could compare the two on the consistency of the cooking, accepting that the lunch menu was likely to contain less superior ingredients. The pricing of the menus have recently been revised in view of the current economic climate. The business lunch menu is now £32 for 3 courses (previously £39) and includes a cheese option, and the tasting menu (Signature menu) is £85 (previously £95). The `a la carte menu is £75 for 3 courses. Canapés were brought to us while we perused the menu. 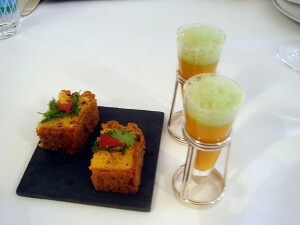 First was a carrot velouté topped with a carrot leaf foam. Disappointingly, it carried very little carrot flavour. With a heavy use of tomato, it could have been mistaken for a tomato soup for it was very acidic. A chorizo cheesecake was not well executed. The saltiness and piquancy of the chorizo was overwhelmed by the sharpness of the Comte cheese which formed the basis of the ‘cake’. From a texture point of view, the cake was too dense. Bread is made fresh in the kitchen, and like her mentor, Darroze serves her bread cold to discourage overeating. There is a variety on offer: white mini baguette, granary, braided baguette, chestnut, rosemary, and apricot & raisin. The quality varied. For example, the white mini baguette was a textbook example of a great baguette, with a crispy crust which gave way to a hollow sound when knocked and a filling that was soft and fluffy. Even better was the rosemary bread, a soft bun with a good amount of seasoning and a light airy centre. Less stellar were the chestnut bread and the braided baguette, both of which had tough crusts. 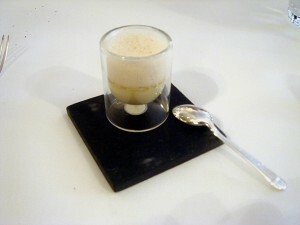 The amuse bouche of foie gras crème brulée, apple sorbet and peanut foam had a nice, subtle foie gras flavour, but was overwhelmed by the foam. This dish conceptually works as peanut and foie gras is not an unheard of combination, and the addition of apple sorbet adds a nice slice of sweet acidity to the dish. However, this version was let down by a lack of balance. From the `a la carte menu, Les chipirons de Ligne, a squid ink risotto with sautéed squid, chorizo, confit tomatoes and parmesan foam, is one of Darroze’s signature dishes, and was featured on one of the final episodes of the 2007 series of Masterchef. The risotto utilises Carnaroli Acquerello rice (2006 vintage), which is a favourite of Alain Ducasse. Because of the aging process which improves the quality of the grains, it enables the rice to absorb more cooking liquid. It is prized for its firmer, crispier texture, and was evident when we ate this dish. As a whole, the dish itself was a triumph – the risotto was creamy and indulgent, yet not stodgy or rich; and the portion size, generous. The squid was nicely cooked without a hint of chewiness, and the acidity of the confit tomatoes complemented the chorizo without overwhelming the dish. However, less parmesan foam would have been preferred as the amount served had the effect of diluting the flavour of the squid ink. Le pigeonneau fermier de Racan, pigeon from Racan was served rare as requested, the bird spit roasted and then flambéd. Again a generous portion, the pigeon was of superb quality, tender without any hint of toughness. This was accompanied by a generous piece of grilled foie gras from Darroze’s home town, Landes, which had a wonderful liver flavour and was evenly seasoned. 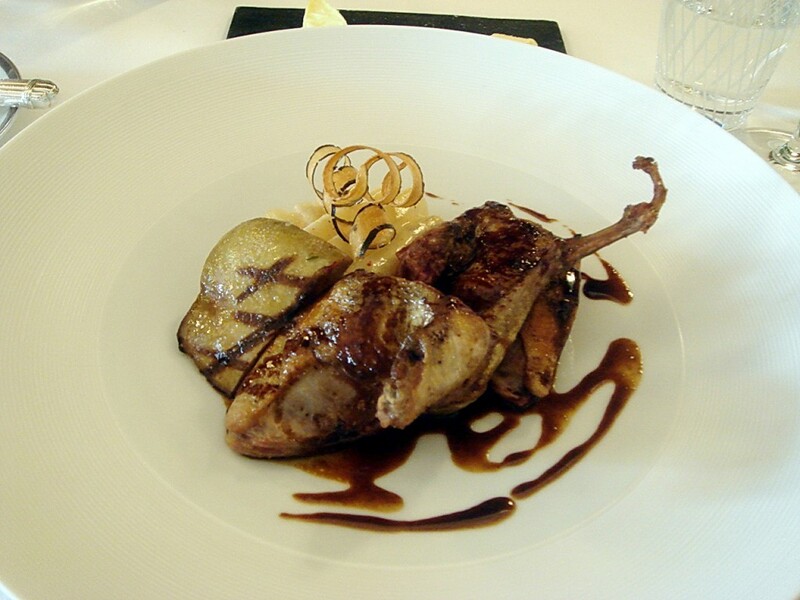 Salsify, cooked two ways – fondant and crispy twirls – added a touch of sweetness, and was a logical pairing with the gaminess of the pigeon. What made this dish remarkable was the sauce. Perfumed with Mexican mollé, it was intense and rich, its chocolatey notes adding great depth of flavour. 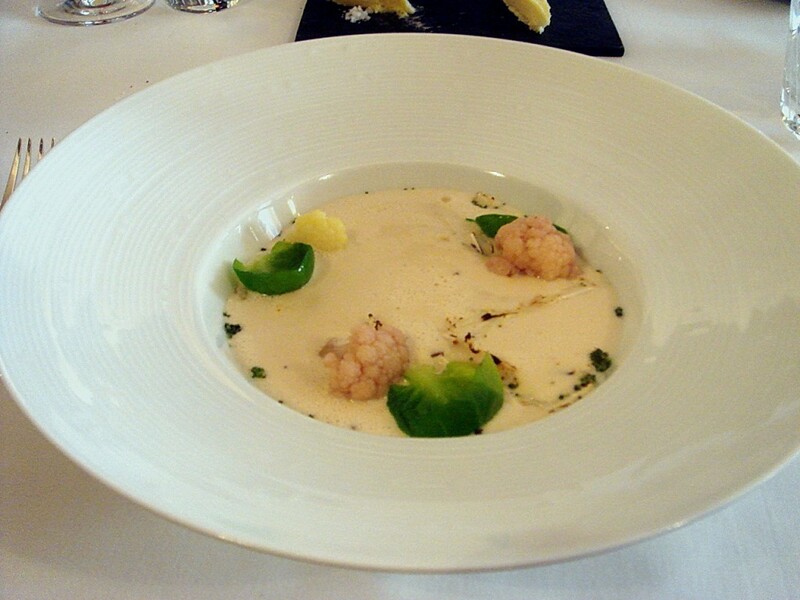 From the business lunch menu, le choux fleur en veloute, a cream of cauliflower soup, was pleasant and creamy, but unspectacular. One couldn’t help but wish for a drizzle of truffle oil to help elevate the soup. 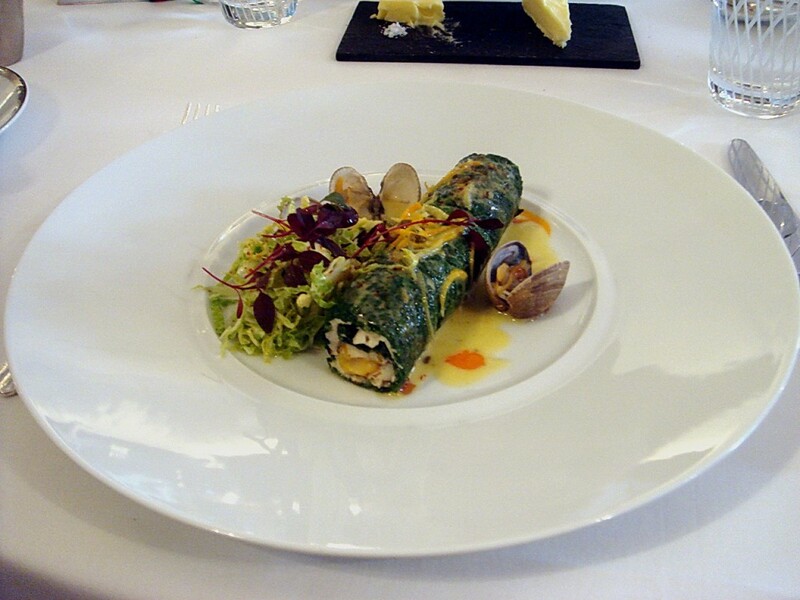 Le choux vert farci, ‘grandma’s recipe’ for a dish of cockles and other shellfish set in savoury mousse and rolled in savoy cabbage, proved to be bland. Finished with seafood jus and citrus butter, the seasoning was also uneven, with certain mouthfuls proving saltier than others. The mousse was also a little too eggy, and additional jus would not have been unwelcome to help boost is flavour. While the use of cheaper ingredients had been expected, the poorer quality of cooking had not. Cheeses are supplied by Bernard Anthony of Alsace, who is well known as one of the top affineurs in the world because of his discriminating quest for quality. The selection is limited to three cheeses, and Anthony’s famous aged Comte was unavailable. Great care was taken in pairing each individual cheese with an appropriate condiment. Le gabietou, a cheese from the Pyrenees made from sheep and cows’ milk, was in excellent condition, the cheese exuding a fruity and slightly nutty bite. This was matched with some candied carrots spiced with star anise. 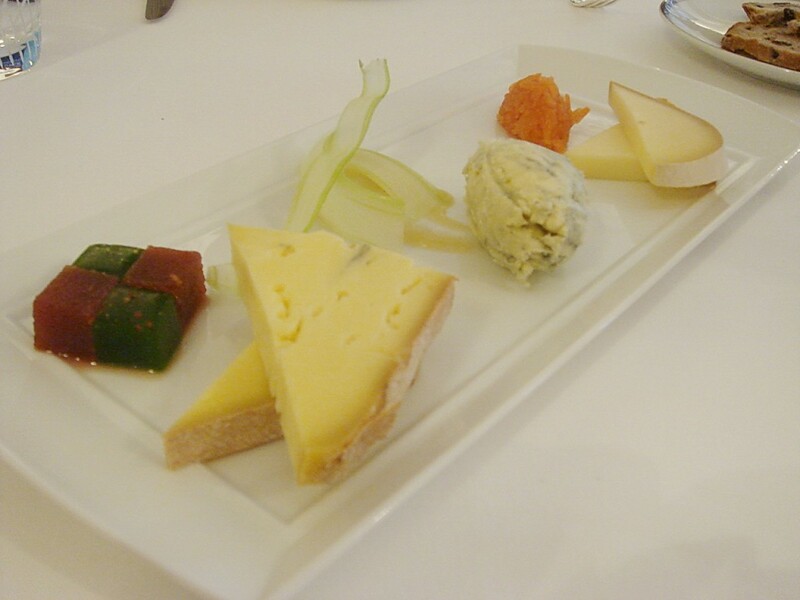 Morbier, a semi-soft cows’ milk cheese from the village of Morbier in France, was accompanied by some quince and cucumber jelly. The cheese itself was mild but it was less ripe than was ideal. Last was a classic pairing of stichelton with pear puree and celery. Stichelton is a type of stilton made in the traditional way using unpasteurized milk, and is produced exclusively by the Welbeck Farm. (You can purchase it at Borough market or from Neal’s Yard Dairy). This cheese was in stellar condition, full flavoured, rich, and creamy. A pre-dessert of avocado mousse, blood orange, almond crumble and hazelnut did not work conceptually. The mousse had the richness and oiliness of the avocado, but tasted rubbery; and the orange, crumble and hazelnut did little to enhance its flavour. 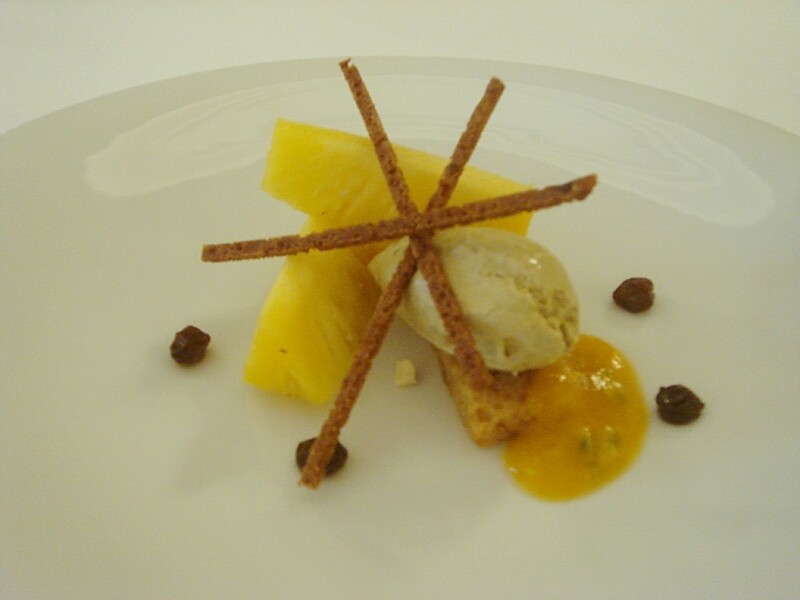 From the `a la carte menu, a dessert of L’ananas Victoria, a light refreshing plate of Victorian pineapple was accompanied by gingerbread ice cream, banana bread (reminding Gen.u.ine.ness of his childhood), juicy raisins soaked in rum, and passion fruit marmalade. Victorian pineapples, despite being a quarter of the size of regular pineapples, are prized for its sweet, intense flavour and this dessert served to highlight the natural beauty of this particular type of pineapple. With the varying elements in the dessert, it came together to create an interesting juxtaposition of flavours that worked in perfect harmony. 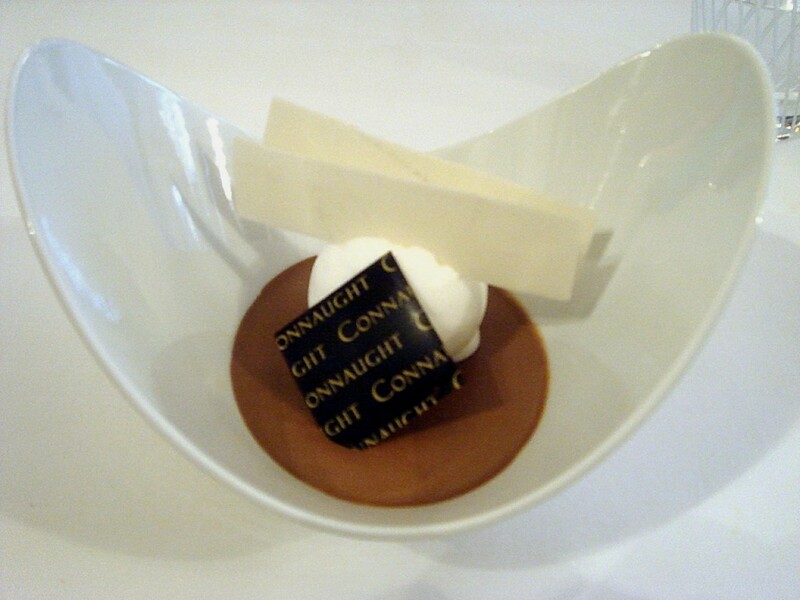 From the set lunch menu, a dessert of le chocolat manjari de Madagascar, a chocolate cream with coconut sorbet, lime and coconut wafers drew gasps of awe. The chocolate cream, slightly heavier in texture than chocolate mousse, was velvety and decadent; and with the fragrant sweetness of the coconut sorbet, made for a true taste sensation. Petits fours (rose water and lychee Turkish delight, lemon tart, chocolate ganache, and passion fruit sorbet coated in chocolate) were a lovely end to the meal and worthy of mention, with the lemon tart being exceptionally good. It had the right amount of tartness backed by a slightly salty pastry. More chocolates by master chocolatier Pierre Hermè may be purchased with coffee at a price of £8 (for one coffee and two pieces of chocolates). Service was pleasant and attentive, although staff could, and should, have had better knowledge about the food they were serving. For instance, when we enquired about the cheeses, our waitress struggled to answer our questions and had to ask in the kitchen. The cooking displayed good technique and sound execution for those dishes from the `a la carte menu. The portion sizes were substantial, and at £75, was a fair price. 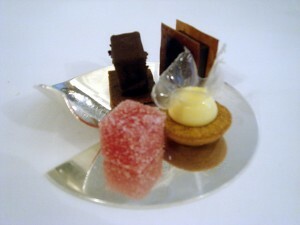 Similarly, the petit fours were of a very high standard. This was a good sign given that Darroze was not in London when we visited. 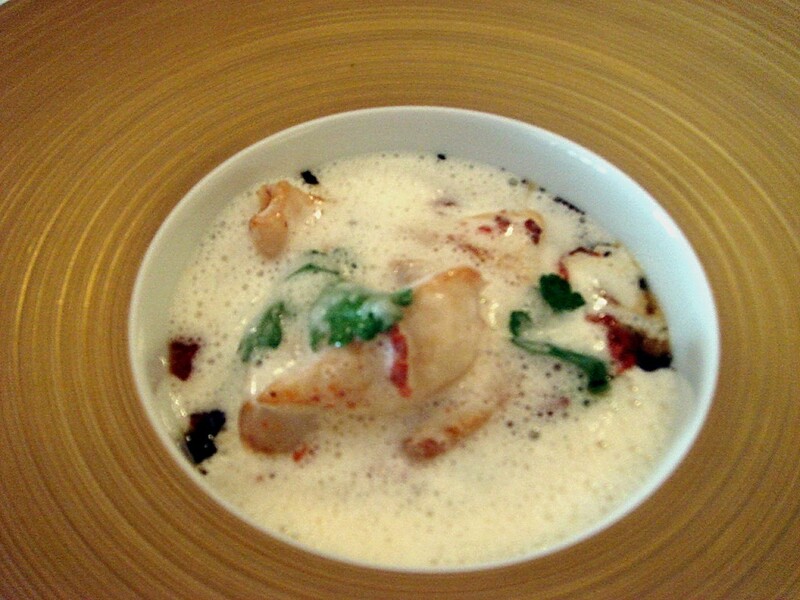 However, there were many inconsistencies in the supplementary dishes (amuse bouche and pre-dessert), and the cooking in the set lunch menu, other than the dessert, did not live up to the standard of a Michelin kitchen. Overall, Hélène Darroze at The Connaught seems worthy of the one star that it earned this year, but perhaps, not the second that it had also coveted. Natasha, please do! I think it’s so great that you you are so inspired and creative. The risotto sounds especially good, I had no idea risotto rice came in vintages. I live and learn! I had the chance to go to Helene Darroze’s restaurant and just like you it was a pure pleasure! One of my best experiences! I wish I’d read this before I went. Couldn’t agree more with your assessment. I was so underwhelmed by everything and it was, at the time the mst expensive dinner I have ever had. Should have just gone to the bar and drank Cristal! I’m thinking of going to the Savoy Grill and Pollen Street Social in a few weeks, do you have reviews for them or any advice.